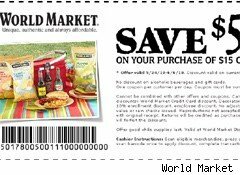 Get $5 off a purchase of $15 or more using this Cost Plus World Market coupon that is good in stores through June 6, 2010. Only the usual suspects - alcohol and gift cards - are excluded. The fine print says "one coupon per customer per day," which means you can print out multiple coupons and use them on consecutive days. Caveats: not valid online. Cannot be combined with other offers, coupons, or discounts, including the World Market credit card discount, decorators discount, World Market explorer 10% enrollment discount, and employee discount. No adjustments to prior purchases. Reproductions not accepted.